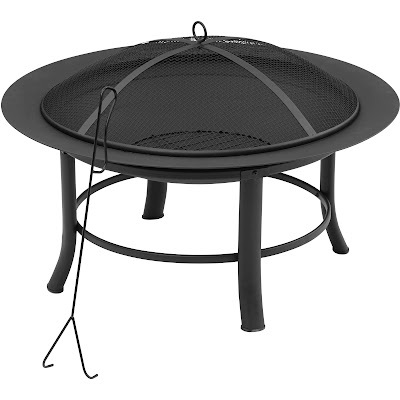 Mainstays Fire Pit - $29.44 + FREE Store Pickup! Right now, get the classic Mainstays 28" Fire Pit at Walmart.com for Only $29.44 + FREE Store Pickup! (Availability of item and pickup depends on your area). The Mainstays Fire Pit, 28" makes a wonderful gathering place for friends and family. It includes a spark guard mesh lid with lid lift and features a durable, high-temperature heat-resistant finish. Easily assembled with a hardware bag included, it also includes a PVC all-weather cover and assembly instructions. This portable fire pit adds a touch of decor to any outdoor area and will provide a warm and cozy place to entertain. It has ample viewing that is possible through the screened fire area and the round handle at the top makes it easy to grip as you move it to your patio or deck.